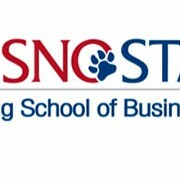 Fresno State’s Craig School of Business released this month its inaugural edition of the Central California Business Review, an annual magazine that features objective and comprehensive economic commentary and analysis on future business conditions in Central California. “We hope the Review will prove to be a valuable public service for businesses and organizations across our region by helping them make informed decisions,” said Dr. Robert Harper, dean of the Craig School. The magazine features insights into the regional economy across multiple sectors including overall business conditions, consumer and real estate sentiments, the labor market, agriculture, manufacturing, banking and global business. Future annual editions may focus on different sectors of the region’s economy. The February 2018 report indicates generally positive economic conditions extending into the near future. The report’s authors are primarily faculty in the Craig School as well as outside professional and community partners. “We are grateful to Wells Fargo as our founding sponsor and to the Educational Employees Credit Union for funding the cost for a marketing survey firm to gather the data for the Consumer Sentiment Index,” Harper said. The Craig School will print about 1,000 copies of the review per year for use by its community partners. In addition, the magazine will be made available at: www.cencalbusinessreview.com.